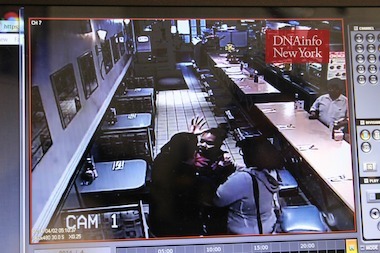 FLATIRON — A woman trashed a Flatiron diner — smashing glass ketchup bottles against a mirror and TV in a videotaped rampage — after a manager asked her to leave for screaming into her cellphone for 30 minutes, the NYPD said. Latima Brown, 22, was having a loud, profane phone conversation when she entered Malibu Diner at 163 W. 23rd St. with a friend about 5:10 a.m. April 2, police and owner Alex Grimpas said. “She was yelling and very upset and very verbal,” Grimpas, who wasn't present at the time, said about the incident caught on the restaurant's surveillance cameras. “We’re used to loud, but the cursing was very heavy." Brown sat in a booth without ordering anything and continued to yell into the phone for about 30 minutes, not stopping when a manager asked her to quiet down, Grimpas said. When the manager finally demanded that she go, Brown spat in his face, threw a glass of water and tried to hit him with a glass container holding sugar packets, surveillance footage shows. "When the manager told her to leave if she wasn't going to order food, she got very irritated," Grimpas said. 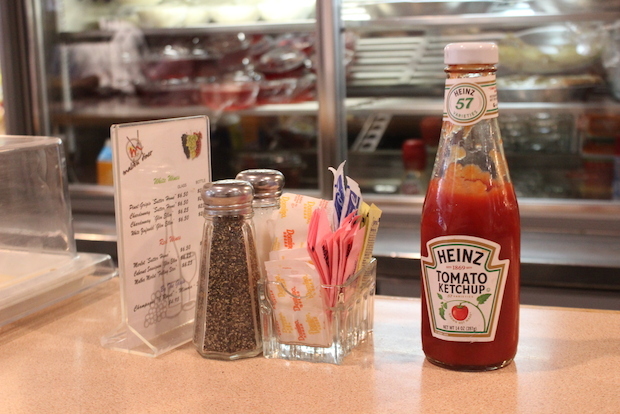 As the manager tried to remove the woman from the 24-hour diner, she punched him in the head and grabbed three glass Heinz ketchup bottles along the way, smashing one against a mirror, another against a wall and hurling one at a flatscreen TV. The TV won't turn on anymore, Grimpas said. “Her friend was trying to hold her back, but she went ballistic,” Grimpas said. When Brown finally left the store, the manager called the police, who caught up with her on the northeast corner of East 23rd Street and Park Avenue and arrested her, police said. The scuffle left the manager with a small bruise on his forehead. About $1,200 in property was damaged during the melee, police said. Brown was charged with assault and criminal mischief and released, according to the Manhattan District Attorney's office. An order of protection was issued during her arraignment. She's due in court May 15. Her lawyer did not immediately respond to an inquiry.